Once you reached a critical mass, like Google has, it becomes very difficult to grow further – In most cases the growth becomes stable. However, in case of Google it doesn’t seem so. We should give it them for constantly improving on each of their products, especially search. Google Search is becoming more and more holistic and is getting further refined where no other search engine can come close to it (atleast at this point of time). This is also attested by the report released by Comscore recently, which clearly shows that when it comes to search, Google is far ahead of the competition and the gap between them and others is only increasing. The global search market grew by 46% in the past year, with both highly developed and emerging markets contributing to the strong growth worldwide. Google Sites ranked as the top search property worldwide with 87.8 billion searches in December, or 66.8% of the global search market, and a 58% increase in search query volume over the past year. Yahoo! Sites ranked second globally with 9.4 billion searches (up 13%), followed by Chinese search engine Baidu with 8.5 billion searches (up 7%). Microsoft Sites saw the greatest gains among the top five properties, growing 70% to 4.1 billion searches, on the strength of its successful introduction of new search engine Bing. 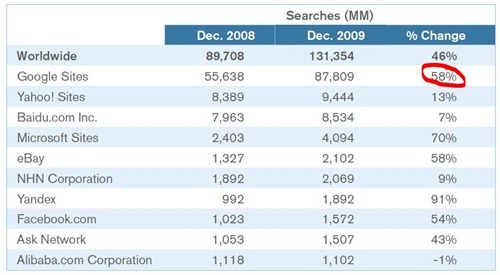 Russian search engine Yandex also achieved considerable gains, growing 91% to 1.9 billion searches. Atleast, at this point of time, I don’t see anyone challenging Google anytime soon, when it comes to Internet search…What do you say?